Strong storm winds can cause devastating damage once speeds exceed 50-60 mph. Trees can uproot and branches can fall. Debris flies around at a rapid rate causing windows to smash and glass to shatter. Yards fill with debris. Fences get knocked down. Damages occur on your roof, garage, gutters and siding. Utilities can be effected due to the high storm winds causing power outages. With weather being so unpredictable, you need a trusted storm damage restoration company to ensure you will be taken care of when disaster occurs from hail and wind. Jersey Pro Restoration LLC has been a leading provider in reliable storm damage restoration services since 2013, and we are here to be your calm after the storm. Our fast response time to a storm disaster can help minimize any further potential damage to your property or belongings. 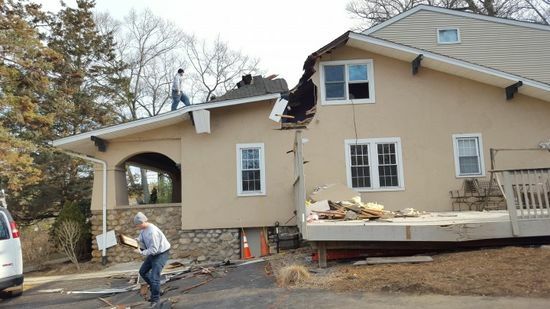 The trusted restoration team at Jersey Pro Restoration LLC will assess the storm damage and plan an effective solution for restoring your property back to its pre-damaged condition. We will properly secure your property in a timely manner and ensure insurance claims are processed smoothly. As your storm damage restoration experts since 2013, Jersey Pro Restoration LLC is here for you when storm damage strikes. Call (973) 291-1321 for FAST response.